Since its foundation in 1881, St Joseph’s College has been renowned for providing boys of a wide range of abilities with a first-class education in the Marist tradition. 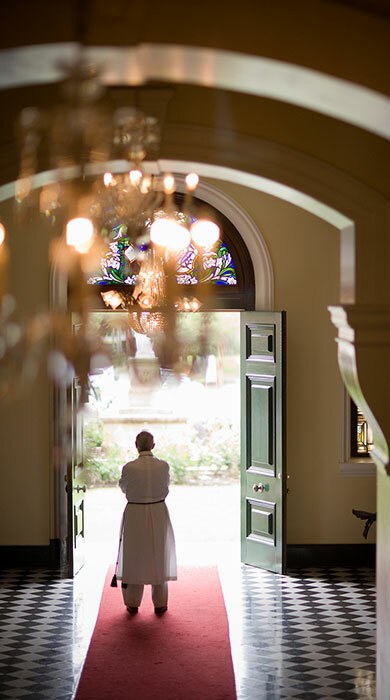 From its early days as a boarding school with less than 100 students and staffed entirely by Marist Brothers, it has grown to become the largest boarding school in Australia. In 2016 the College has a student population of 1098 students, of which 536 are boarders (278 weekly boarders and 258 full boarders) and 562 are day boys. The College has a very large community of dedicated Old Boys, many of whom return to the College on regular occasions and others who maintain a strong and active relationship with the College community. An independent Catholic school, St Joseph’s was founded in 1881 by a French teaching order – the Marist Brothers – who had sent four pioneering members to Australia in 1872. The College grounds were bought by the Marist Brothers in 1876 for the purpose of building a novitiate and a boarding school for boys. 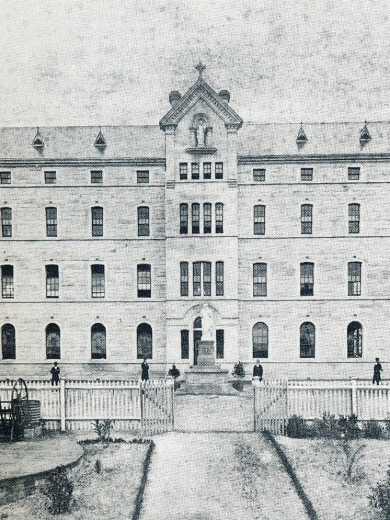 The novitiate was opened in 1878 – a two-storey stone building that still stands in the College grounds today. The work of the novitiate was essential to the yet-to-be-established College, as it prepared many of the Brothers who were to later become College staff. In 1881, the boarding school that had been part of Australia’s first Marist school, St Patrick’s in Harrington Street, Sydney, was transferred to the Marist Brothers site in Hunters Hill. St Joseph’s College officially opened on 18 July 1881 with 55 students in a temporary wooden building that was located between the present swimming pool and the squash courts. Construction began on the permanent College buildings in 1881. The southern wing of the present large stone building was built first and originally stood on its own. From 1889 to 1894 the northern and central wings were built. The completion of these wings created a beautiful and architecturally impressive school that still dominates the skyline from many viewpoints today. The College playing fields in Augustine Street, known as The Park, were bought in 1893, as there were no suitable playing fields on the site of the College buildings. This coincided with the establishment of the Athletic Association of the Great Public Schools of NSW (AAGPS) in the early 1890s, of which St Joseph’s College was a founding member. 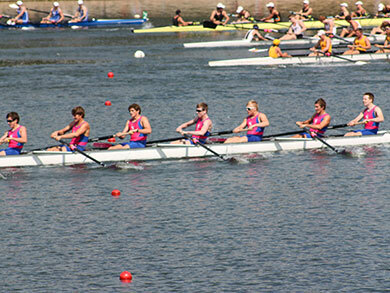 Participation in GPS sporting competitions has remained a feature of the College up to the present day. 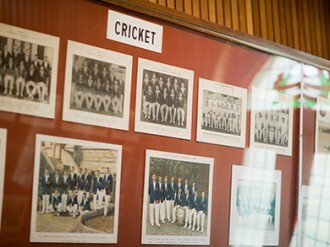 One unique feature of the College from its very inception was the fact that its students were all boarders, a practice that continued uninterrupted from 1881 to 1996. Because there were very few schools in the rural and remote areas of Australia, boarding was the only way for boys from these communities to obtain a high-quality secondary education. There was also a belief that boarding was a positive experience for boys because it could lead to the creation of an intense community spirit among a body of students, a facet of life that was obvious from the College’s earliest days. Boarding also presented an opportunity to train students very thoroughly in the practice of their faith, especially when almost every one of their teachers was a religious Brother. St Joseph’s has always aimed for excellence and has encouraged its students and staff to be the best they can be. Throughout its history, many brilliant teachers have helped students achieve outstanding results in public examinations. 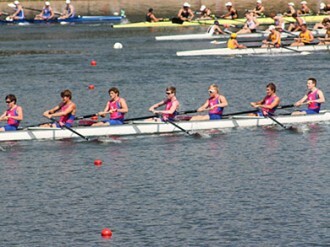 As early as 1885 St Joseph’s obtained more passes in the Senior than any other school in New South Wales or Queensland. In 1890 Joeys students won the coveted Barker Scholarship, after coming second in 1889. Such successes are found consistently throughout the history of the College, perhaps in particular under the teaching of the famous Brother Liguori who, in one year, had seven of his students fill the first 11 places in the state. In recent years the College has celebrated strong individual and group results in the Higher School Certificate. Since 2009, 16 students have been named in the Top Achiever’s in Course list, with three students achieving first place in a course. Many Joeys graduates gain entry to highly demanding university courses, including medicine, law and veterinary science, based on their HSC results. The provision of good exercise and physical activities for the students was an early priority, evident in the purchase of The Park in 1893, which has been developed over the years into superb playing fields. The same healthy and competitive spirit led to the acquisition of a rowing shed on a nearby arm of the harbour, Tarban Creek, and to the building of baths there. 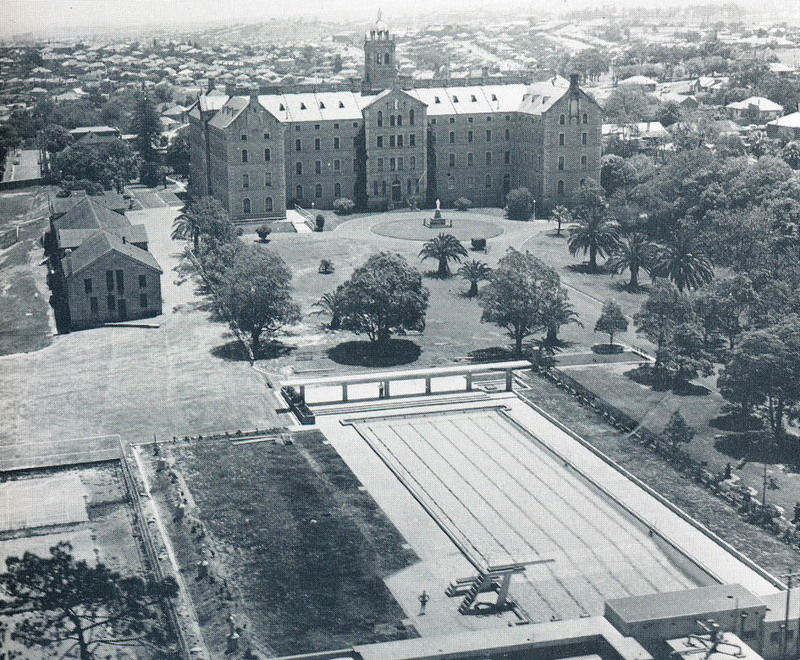 Later, the College was one of the first schools in Sydney to provide an Olympic pool in the main grounds. In more recent times, the College purchased and developed its own outdoor education centre, Colo, on the Colo River, which began operation in 1986. The main building had been constructed with such foresight that, with the addition of the magnificent Chapel in 1940, it was able to provide all the teaching and living spaces needed until the 1960s, when the teaching wing named for Pope Pius X was opened. Other amenities followed over time, including the individual study-bedrooms for senior students, modern dormitories for younger students and shared common rooms and recreation areas. The teaching wing was greatly extended and a new specialist Science teaching facility was added. Around the time of the College centenary in 1981, the Brother Emilian Hall, and the adjacent gymnasium, was constructed. A former outbuilding became the Art Centre and the very large space beneath the hall was transformed into a music centre. More recently, the south-east corner of the campus saw the construction of a purpose-built accommodation wing for students in Year 11. In 2008 the Year 12 accommodation block was completely refurbished. Bedrooms were stripped and received new furniture and carpet with underfloor heating, new day-student study areas were created and all new, larger bathrooms and plumbing were installed. In 2012 the John Healy fitness centre was relocated to the site of the former College Laundry when the laundry was moved off-site. This is a large, well-equipped gymnasium that is complemented by the College’s cardio centre and available to all the students for training and fitness purposes. In 2013 College opened a superbly equipped Technology and Arts Precinct. This multi-level contemporary facility allows students from Years 7 to 12 to explore and develop their creative talents in spacious, flexible and dynamic learning areas. It also allows lift access to all levels of the classroom wing, ensuring the entire classroom precinct is fully accessible. Over time, the number of Marist Brothers actively associated with St Joseph’s College diminished and the number of specialist and support staff increased. In 2006, the College appointed its first lay Headmaster, Mr Ross Tarlinton. Also in 2006, the College introduced the very significant change of accepting enrolments from day students. It is a major accomplishment that this change was accomplished without any loss of ethos or division among the students themselves. The College continues to appeal to rural parents, with a significant number of students coming from regional/rural Australia. Many families who live closer to the College find weekly boarding is a flexible enrolment option that gives boys the best of both worlds. The changes that have taken place at Joeys in the 21st century have proven the College’s ability to successfully respond to new circumstances and challenges within a rapidly changing world. The essential spirit of the College, however, continues to burn brightly. Just as it has always done, the College community strives to provide the best education and opportunities for boys in an environment that is safe, caring, happy and conducive to personal and academic excellence. St Joseph's has always aimed for excellence and has encouraged its students and staff to be the best they can be.